Which treatments should you use after a Brazilian straightening treatment? Brazilian straightening is a keratin treatment which works deep down and calls for specific upkeep. To make the most of your soft straight locks for as long as possible, read on to find out about the hair regime to adopt as soon as you leave the salon. Once the dose of keratin has been injected into the heart of the hair fibre to relax it, you must keep your hair's cuticles tightly closed so as not to deplete the levels of keratin. However, when you come to wash your hair, regular shampoo can damage the hair's natural protective barrier by opening up the cuticles on the hair shaft, thus allowing the treatment to escape. To get around this issue, opt for a shampoo with a sulphate-free formula or with a mild PH which will cleanse your hair, whilst keeping the cuticles closed and preserving the keratin stored in the hair. A professional tip? Say goodbye to excessive daily washing to get perfectly smooth straight locks long-term . Leave longer intervals between hairwashes, limiting them to no more than two per week. 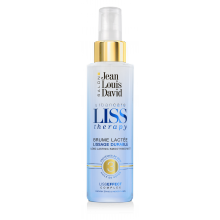 To take care of your sleek straight hair, use a conditioner or mask rich in keratin proteins once a week, such as those from Jean Louis David's Keratin Therapy range . Apply the product to clean squeezed-out hair and spread it from the mid-lengths down to the tips. Leave it to work for a few minutes so that the keratin has time to fill any gaps in the hair fibre and thus prolong the effects of Brazilian straightening . Your hair will be full of vitality, soft, shiny and still just as sleek. Brazilian straightening: how to look good in the summer?